We put the focus on your educational needs – and a need-based training leads to success. Therefore, comprehensive analysis and advice are required in advance. Instead of call centers, we rely on qualified, experienced consultants who determine educational needs “actively” in a personal and on-site conversation. Learn what really helps you grow – efficiently, practically and always at the highest level. We assess the optimal training to fit exactly to your educational requirements and the individual education goals of your coworkers. This is applied to your employees training preferences, whether in the classroom, via app, or in the virtual classroom. For you, this means learning with and from the best. We are not only your education partner, but also support your training management. Participant monitoring, attendance overviews, feedback sessions and test evaluations are part of our all-round service. Learning is always happening. We evaluate the return-on-education of all personnel development which is carried out at regular intervals for you. “Learning for life” is our philosophy – and our promise to you. The functional training is the foundation, and should be effectively prepared to help lead to success application. 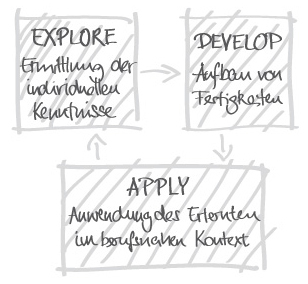 This is guaranteed by the EDA-Method: Explore, Develop und Apply. We determine the current level of knowledge of your employees, develop the necessary skills and then apply them consistently in professional situations. 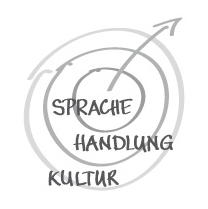 Language, Action, Culture: These three components are not only outstanding success factors in fast-paced business life, but also the three pillars of our educational offer. Is the intensive English course “beside” the presentation seminar enough for you? The individual skills must be coordinated so that the learner can act competently in the international professional environment. With our 3-in-1 model, you benefit from a effective solution – you get everything from one source and integrated in a modular system. Learn where you want. Whether you’re in the company, in one of our educom centers in the D-A-CH region, in a hotel or in a virtual classroom, you have the choice. Our quality standards, the educom philosophy and the extraordinary customer orientation stay a part of our method regardless of location and area. Which way will your employees take to reach their destination? Here, too, you have the choice: our classroom training courses can be booked for private, team or group variants – depending on the individual support needs of an employee or a small group. Our large number of open trainings with a broad range of topics and regular appointments enables your company to quickly find learning solutions at short notice. Of course, all forms of teaching – whether online, or offline – can be combined. 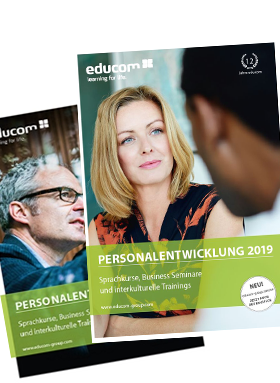 You can find out more on our infopage digitization: “educom Lernwelt 4.0”.